Keep Walking, keep, keep Walking. Johnnie Walker is one of the most recognised Whisky brands in the World. It is also the best-selling Blended Scotch world-wide. The brand was established in 1860 by John “Johnnie” Walker, when he opened a grocery shop in Ayrshire, Scotland and started blending Whiskies in small amounts. Success came with his son, Alexander, who established the Whisky as a popular brand – mostly during the Victorian times when it was heavily exported around the British Empire. Johnny Walker is known for its square-shaped bottle, the label which lays at an angle of 24 degrees and their logo – the famous walking man. 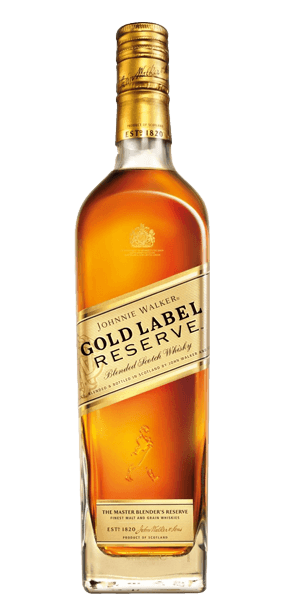 Johnnie Walker Gold Label Reserve replaced the Gold Label 18. It’s a multi-layered blend of the favorite Whiskies of Jim Beveridge, the master blender at Johnnie Walker. The Gold Label Reserve comes without an age statement. What does Johnnie Walker Gold Label Reserve taste like? The Flavor Spiral™ shows the most common flavors that you'll taste in Johnnie Walker Gold Label Reserve and gives you a chance to have a taste of it before actually tasting it.